Just into the new year and already thinking of sowing seeds. Too early yet for the tomatoes but I’m trying cold sowing of some seeds again. I had some success the first year but not much last year, so this time I intend being better prepared. My starting equipment is five-litre water bottles, coir, a skewer, plant labeller and a roll of duct tape. I have also added small paper maché pots in an attempt to make removal of some of the seedlings easier, particularly for the beans. I am growing Karmazyn beans again, the pretty pink beans were really nice either raw in salads when young or cooked when matured. 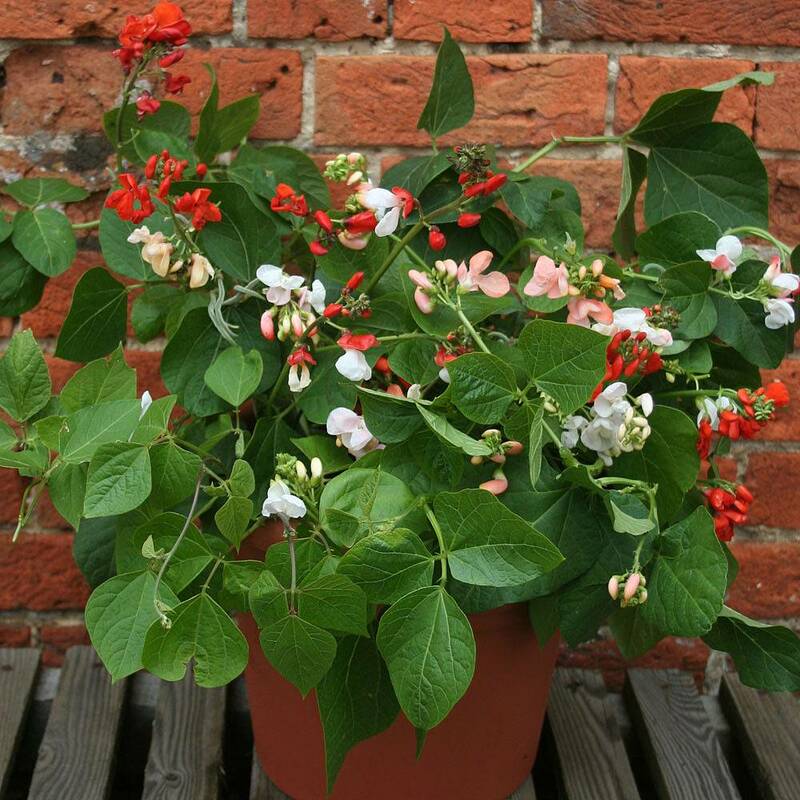 Jackpot Mixed are dwarf beans suitable for growing in pots with attractive red, white and pink flowers. There appears to be two varieties, one I think maybe Hestia which I have grown before. but slugs and snails beat me to them. I caught a snail about to bite off a bean pod which was meant for me. It lost! I am including a separate bottle of Hestia beans because the Jackpot Mixed is a mix of unnamed white or red beans. Borlotti is the bean recommended by everyone but I am growing it for colour as well as taste. When you have next to nothing for a growing space, you need to consider everything. Green plants, insignificant flowers and green pods are fine but I like to bring a little bit of colour into it as well. Winged Bean (Psophocarpus tetragonolobus), I have failed miserably in growing this bean. It is a warm weather bean, high in nutrients and all parts of the plant can be eaten. It will probably be allocated a space in the greenhouse. Although with all the plants I want to allocate space in the greenhouse to, I think I really need a very large polytunnel! Coir is clean to work with, although it has no particular nutrients of its own, the block I use has nutrients added so hopefully it will give the beans a start. Last year, I used compost but felt it retained too much water. We do get a lot of rain so I am hoping the coir will be lighter without turning the bottle into a bog terrarium. The small block I use expands to 10 litres with water, making it easy to store dry, clean and light to use and a little goes a long way. The water bottles I use, have a carry handle at the top, so all being well, once everything is sown in them, they can be kept together and prevented from blowing over by running a cane through the handles. The skewer is heated and used to put drainage holes in the bottles. Labelling is a must, I have tried Sharpies and permanent markers but by the time the bottles were opened, much of the identities had faded. The best thing I have found was my plant labeller. I put a label on the outside of the bottle and one on a plant marker inside the bottle. With a bit of luck, after the bottle has served it purpose, the label on it could be reused on a plant marker.